Mexico City was devastated the last tuesday for a terrible earthquake. We are working hard doing rescue labors, lifting debris, designing infographics to inform (as we don’t trust in the “official mass media —fake news”) providing food and water to people who are putting their lives at risk by trying to rescue others, doing street work, transporting, well; contributing with everything we can. Unfortunately, we need more than our hard work to achieve the normality. We love our city and our people, but the corruption is present in the political class. So WE, the people are taking the problem in our shoulders. Starting today and up until the 15th of October, all sales of the Umor Rex digital catalogue managed through Bandcamp will be channeled to the Red Cross in Mexico (100%). 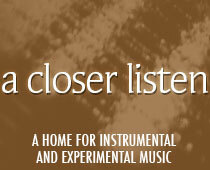 It is easy for us to manage the donations via bandcamp purchases. But direct donations to Mexico’s Red Cross are welcome too, and this is the proper link: https://www.paypal.me/cruzrojamexicana. Our thoughts and prayers are with those who have lost loved ones, homes and precious resources. If you’d like to help, please do so in any way you can ~ but if you’d like to help and receive some great music at the same time, we direct you to the Umor Rex website here. Perhaps you’ll be interested in the new album from Rafael Anton Irisarri, or classics from Driftmachine, Koen Holtkamp, Felicia Atkinson, Good Willsmith or Kara-Lis Coverdale. Perhaps you’ll find a new favorite. Whatever you choose, you’ll be helping to restore lives. Thank you in advance from Umor Rex and A Closer Listen!